Oh readers, it's proving a lot harder to get on to here to write blog posts than I'd expected. R is in that 'grumpy in the evenings' phase at the moment which is fine but does mean that my time is somewhat limited. Add that to trying to cook meals and a four year old who is definitely overtired at the end of the half term and it's tricky. I've mentioned before how much I like Simon Rimmer's Seasoned Vegetarian - here is my adaptation of strawberry cookies and my less than successful attempt at puy lentil casserole. I even featured it as on of my top five books on Essbeevee. I got rather excited in my local Morissons when I spotted a tin of beans I hadn't seen before - 'rosecoco'. A bit of an Internet search reveals that these are also known as borlotti beans. These beans helped to provide a bit more variety and helped it to feel a bit more like a meal rather than a snack. It lightens up on the spice just a touch to appeal to a younger palate. D wasn't too impressed with the potatoes - I think I'd make his portion without the cumin seeds next time. He did like the beans but the spinach wasn't so popular - as this is added right at the end I'd possibly take his portion out before adding it. I also think this is worth adding srirarcha to the adult portions just to provide a little more of a kick. 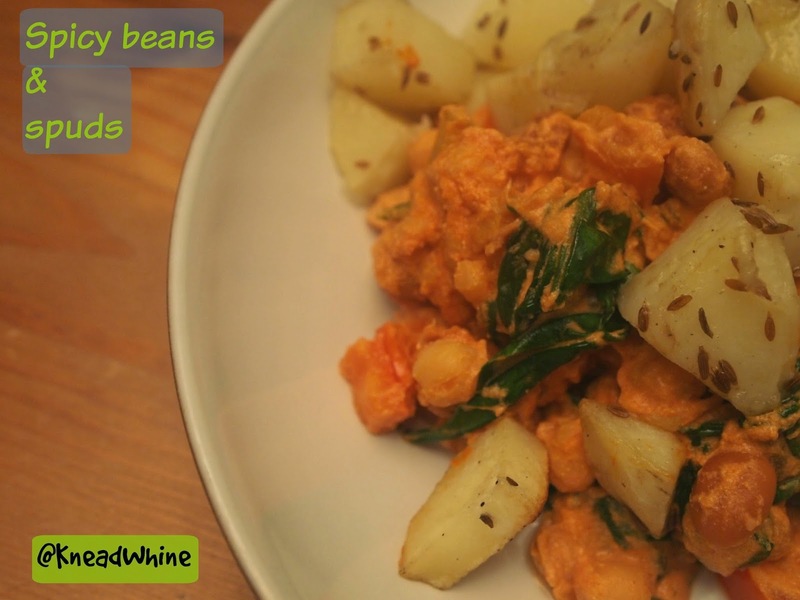 This is an adaptation of Spiced Chickpeas with Cumin potatoes. 2 tbsps lemon juice or the juice of half a lemon. Meanwhile, in a pan, heat the remaining olive oil and soften the garlic, chilli and celery over a medium heat. This will take around ten minutes. Add both types of paprika, tomato purée and mix well, ensuring that the vegetable mix is well coated. Add the crème fraîche, the beans and chickpeas, again stirring well to ensure that the tomato mixture is well distributed through and cook for a further five minutes. Finally, add the spinach and allow it to wilt, taking a further five minutes. Add the lemon juice and serve - the beans/chickpea mixture and then the potatoes on top. Convince your son that the spinach won't kill him, that the potatoes are not covered in gigantic pepper seeds and watch him devour the beans.